LUX*, South Ari Atoll, has been the top contributor to the Big Fish Network for two years running, directly contributing to the understanding of whale shark population dynamics in the Maldives. For the staff and crew at LUX* though, it’s not all about the whale sharks! 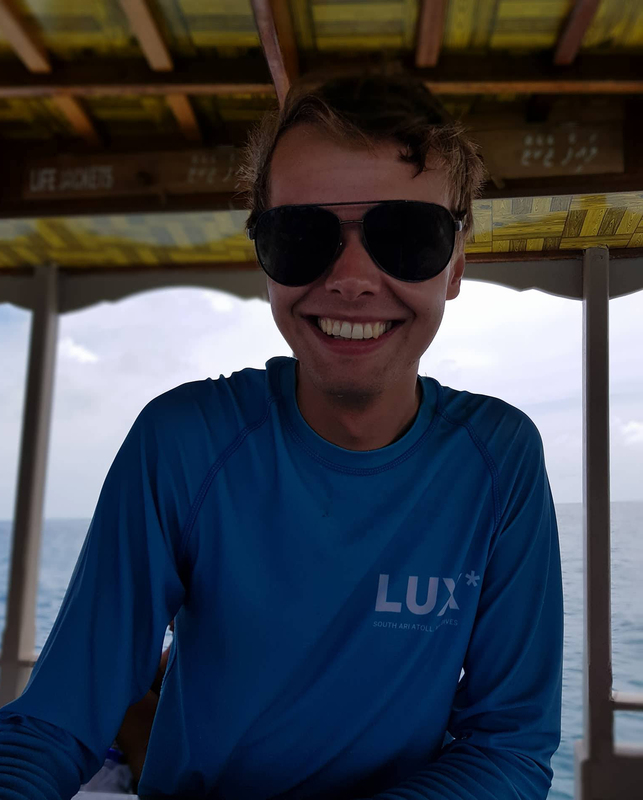 So we caught up with their Marine Biologist Mark McMillan to find out what else LUX* does to help conserve the unique marine ecosystem of the Maldives. 1. What conservation work is LUX* currently involved in? Here at LUX* a lot of my job involves taking guests out on daily marine biology excursions. Whilst out in the field, I will always try to record data and collect photographs on the various marine species we encounter. All of this data I will then send to the relevant organizations to help with on-going research and monitoring. At present, I have had the pleasure of supplying data / photographs to Maldives Whale Shark Research Programme, Olive Ridley Project, Manta Trust and SharkWatch. 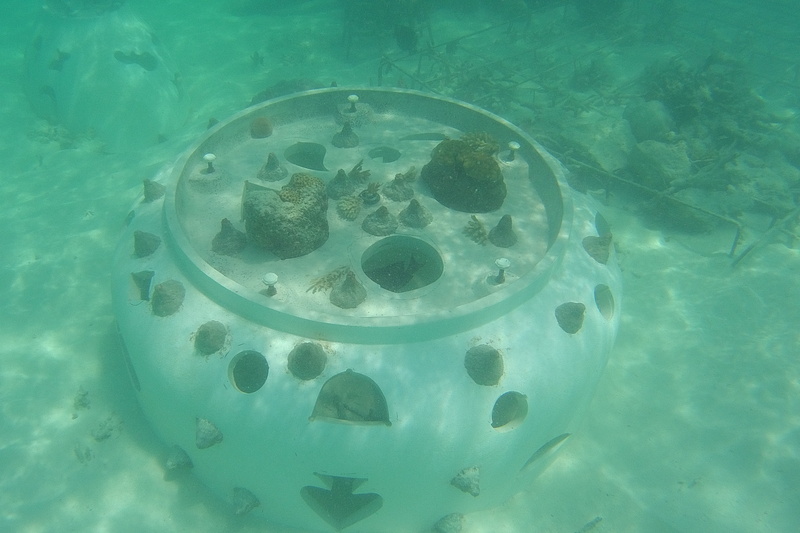 I am also hoping to start some coral conservation work here at the resort in the form of coral planting. At present I am experimenting with frames; having found what appears to be a suitable spot I am currently monitoring these frames to see if the coral fragments will survive. As a company, LUX* Resorts & Hotels runs the Tread Lightly project which invites guests to offset 100% of the carbon emissions produced during their stays. This voluntary carbon offset contribution is then used to help fund various environmental & conservation projects. 2. Does LUX* have any long term conservation goals you are working towards? 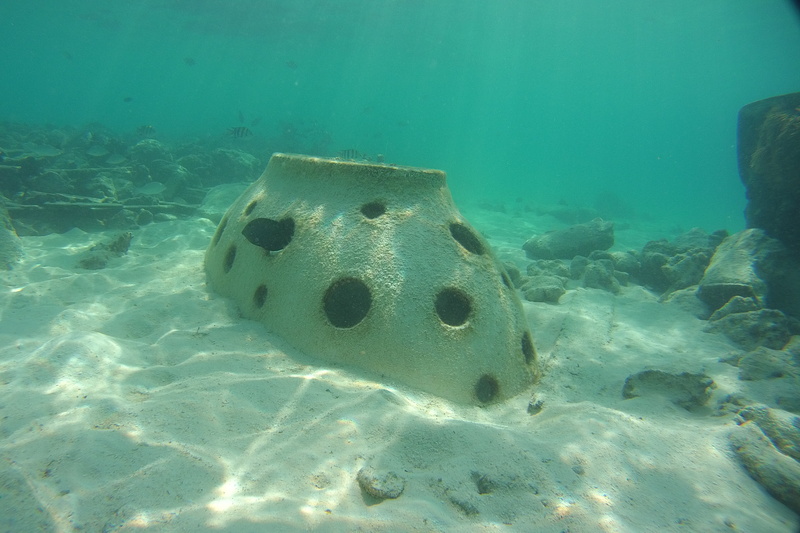 One project I am currently working on is trying to build a small-scale artificial reef on the arrival / lagoon side of our resort. There is already an abundance of marine life surrounding our arrival jetty but I am hoping to enhance this, creating more habitat for fish and invertebrates in an otherwise barren, sandy area. So far, various rocks and remnants of the old arrival jetty have been used to start this reef and we have even introduced some unused (and extremely heavy!) bath-tubs (see images) which are proving very popular with the fish! Small corals are also starting to grow on the substrate here and my experimental coral frames appear to be thriving. For me, the goal is to enhance the bio-diversity in this area, helping the local marine life and encouraging coral to grow. Although this project is only in the very early stages; – things are looking promising! 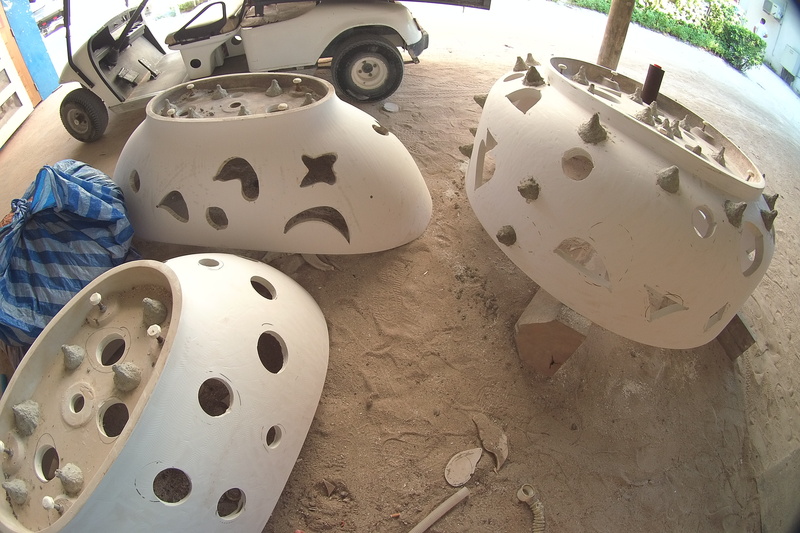 Throughout the rest of the resort we are also looking at different ways in which we can become more eco-friendly. One thing I am very pleased about is that as of April 2018 we are phasing out the use of plastic straws and replacing them with paper straws as an alternative. 3. What inspired you to become involved in marine conservation? Ever since I was very young I have always wanted to work with animals and nature. Initially I wanted to become a zookeeper and look after zebras, but inspired by nature documentaries and aquariums I soon became fascinated by the underwater world. From then on, I wanted to become a marine biologist. At the age of 16 my first job was working in an aquarium and my passion for the oceans and their conservation has only grown stronger as I’ve got older and learnt more about why we should protect our planet. 4. How important do you feel citizen science is to ongoing research? Vitally important! With the help of the general public, citizen science allows lots of valuable data to be collected and ultimately gives us a better understanding of the natural world. In regards to wildlife, citizen science can help us to answer important scientific questions regarding particular species; which of course is crucial if we are to try and protect these species. 5. Do you feel you are making a difference in the work you do? Absolutely! I strongly believe that as marine biologists if we are going to conserve our oceans, education and public awareness play a huge part in making this happen. Every day I aim to do exactly this; – whether its explaining to people what coral bleaching is or trying to change people’s negative perception of sharks; these are things that get people thinking and will hopefully make more and more people want to help protect our oceans. 6. What is the most rewarding aspect of your job at LUX*? Seeing how happy and excited people are when I show them a whale shark, manta or sea turtle for the first time is very rewarding and feels like a job well done! 7. What has been your most memorable experience in the Maldives so far? Back in 2016, whilst I was doing some training with the team at Marine Savers, I got the opportunity to help release an olive ridley sea turtle from our rehabilitation center back into the wild. Having worked hard to nurse this sick turtle back to full health, we were able to see all our hard work pay off as the animal swam off quite happily. This was a particularly special moment. Also the first time I encountered a whale shark here in South Ari! I remember I was on a dive outside the island of Maamigili and this enormous creature just appeared from out of the deep ocean onto the reef. It was a breathtaking moment and one that I will not forget. 8. What is your favourite marine animal and why? Beluga Whale. I just think they are really stunning creatures. I would love to see them in the wild someday. 9. Is there anywhere in the Maldives that you haven’t been yet but would like to go? For sure, I would love to travel further north and visit the Rasdhoo Atoll so I can dive the famous Hammerhead Shark Point. 10. What one piece of advice would you give to all the aspiring marine biologists and conservationists out there? Never give up! I have always wanted to work in this field for as long as I can remember, but it hasn’t always been an easy career path to follow! Gain as much experience as possible, keep working towards your goals and eventually you will land your dream job.